Dig Your Well Before You’re Thirsty is packed with anecdotes of American icons, from Billy Graham to Muhammad Ali. Comprising short chapters, this quick, entertaining classic offers a wealth of practical, applicable information on how to build a strong personal network. Mackay, a master networker and communicator, conveys his message without belaboring a point. With his trademark casual style, informal voice and easy humor, he covers the basics of networking and offers a variety of creative suggestions to help you develop lasting, mutually beneficial relationships. Regardless of your current level of networking prowess, you’ll find a wealth of insight from Harvey Mackay in Dig Your Well. In Dig Your Well Before You’re Thirsty, Harvey Mackay’s clearly stated goal is to help you build relationships you can turn to during moments of crisis. To develop meaningful connections, it’s important to listen for and collect the right type of information. Whether you prefer to use software or an old-fashioned Rolodex, Mackay advises mimicking the practice of former U.S. presidents. These men became connected, at least in part, due to their extraordinary efforts to make others feel valued by learning something personal about each individual. Several, including Bill Clinton, Lyndon B. Johnson and George W. Bush, gathered information and made follow-up contacts mentioning the personal tidbit. Mackay suggests keeping notes on each of your contacts. In addition to standard business-related information, those notes should include birth dates, family member names, hobbies and pastimes, favorite charities and even relevant conversational notes. The key to making the contact feel valued is to pay attention to what he says about his likes, dislikes, hobbies and needs. Then, appropriately apply that knowledge. For example, if you are aware that a contact is participating in a special event, make note of it and follow up to see how the event went. Too often we think the networkers we most admire were “ just born that way.” It’s a myth. The best networkers try the hardest and give it the most thought. So how do you do it? Building a network is really a lot like digging a well. First, there’s a decision. “Guess what? I might be thirsty one day. I just might need a well to draw on. I think I’ll work on that.” Then there’s the homework—getting prepared to dig. Then you have to actually get started. That’s a hump a lot of people never get over in other areas of their lives. But the good news is, as far as networking goes, you’ve already started. You have friends, family, co-workers, teammates, neighbours, fellow church or synagogue members, and on and on. Now you have to expand and excavate from where you’ve started digging. Most well-intentioned laborers of any stripe start out with gusto, applying the shovel lavishly, sweating profusely. Then they stand back and survey their progress. That’s usually about the time they realise they need to hone their skills. Once you’ve got the skills in place, you can really let fly and dig deeper. Not mindlessly and by rote, however. You’ve got to dig thoughtfully, creatively and with a little class. That’s how the network gets bigger and the well gets deeper. Then there’s the maintenance. Nothing a man or woman ever built stayed in perfect shape without a lot of TLC. Ditto your network. Staying in touch with contacts is as important as getting them in the first place. And don’t forget about pitfalls. None of us is immune to mistakes. Luckily, you have role models to follow and people like me who have already made all the mistakes—learn from us. You’ll notice you’re having a good time. In fact, you’ll realise you’ve found the well of life—other people. WHERE TO START: THE FOUR BEST PLACES TO GO PROSPECTING. Okay, you’ve decided to build one of the best networks the world has ever seen. You’ve started with your family, moved to your extended family—and their extended family—and then networked up, down and sideways at work. Now what? I would make tapping into the following four groups my next step, be it bowling, bridge, or helping kids sell cookies, the power of club membership is far reaching. It will propel your career and change your life. The connections you make within these organisations are on shared interests. While you may learn the latest industry gossip at a professional association, don’t discount the value of networking through non-work-related activities. These widen your horizons and make you an invaluable part of other networks. You Need More than Name, Rank and Serial Number Pale ink is better than the best memory, and you’ll need more than just a simple business card to become an excellent networker. Remember I told you that you would have to dig creatively and thoughtfully to be a good networker? After making a connection, you’re going to want to build on it. This is where the creative and thoughtful part will come in, and it will be more difficult to be creative and thoughtful if all you know is name, company and phone number. Accomplishments • Significant Career History. Add a check mark to the card if you have referred business to them or are a particularly good customer of theirs. A network expands your financial reach infinitely. 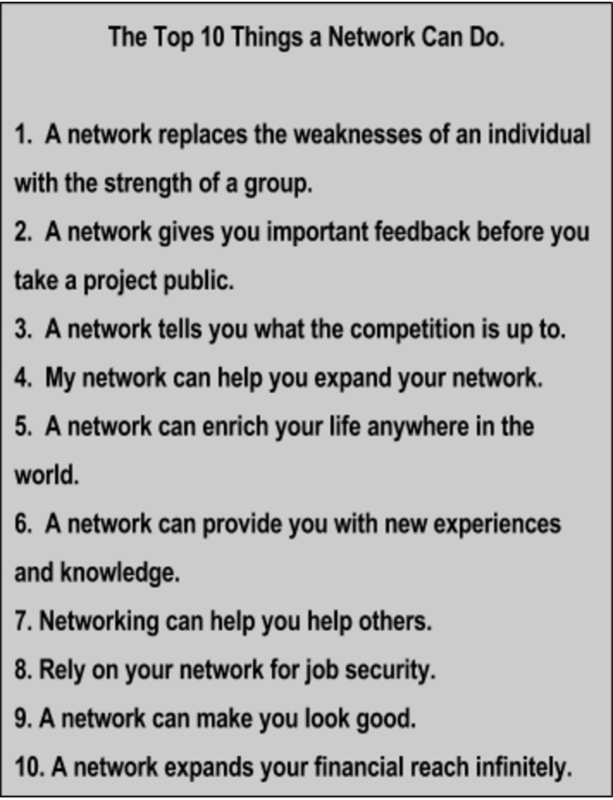 The most effective way to expand your network is to trade networks with someone else. How big is your network? If you answered infinite, you’re right. At this writing, you’re only limited by the number of people on this planet. Your network is potentially the size of all your contacts, plus all your relatives’ contacts, your friends’ contacts, your business associates’ contacts, and so on. Say you want to introduce a new service you offer. Are you going to limit the list to the names you’ve been able to scrape together? Of course not. You’ll ask me for my list, and if I like the offer I might even ask a few other people for their lists. Instead of a few hundred names, you now have a few thousand. A word of warning: Remember to treat anyone’s contacts with the utmost respect. Like tightrope walking, this is a system based on trust. A fall from grace, like a fall from the high wire, can be very hard to recover from. Mackay’s Maxim When two people exchange dollar bills, each has only one dollar. When two people exchange networks, they each have two networks. If you’re not a public figure, then there’s the inevitable moment when the question comes up, “What do you do?” I’m in favor of a multiple-choice answer, because it gives the other person a couple of ways to connect. I usually say something like, “One, I sell envelopes. Two, I write self-help books. And three, I jog. I’m always looking for ideas for one and two and always trying to figure out how to get paid for number three.” Whatever your gig is, put a little pizzazz in your answer when asked, “What do you do?” And prepare it, carefully, even though when you give it you’ll want to toss it off without sounding as if you were reciting name, rank and serial number. It’s probably the one question you’re sure to be asked and, apart from your name, the one thing people will remember about you, so you’ll want to use your answer effectively to help build your network. A network expands your financial reach infinitely. One of the purposes in networking is to get you to stand out from the pack. What do you do to make sure you stand out? You have to use your imagination. Here are three quick examples. Don’t ever send another business Christmas card.Oh, sure, they’re lovely. Sending cards is a nice gesture and everyone does it. But that is exactly the point. Everyone does it. And because they do, nobody remembers them. Don’t get lost in the crowd. Instead of sending Christmas cards, send Thanksgiving cards or Easter Cards. Your card will likely be the first holiday impression a person gets. Be polite.You don’t think this will make you stand out? You’re wrong. We are all too time-stressed. We can never get it all done. These days the person who responds quickly to a phone call or to a note has discovered a true way to be a differentiator. One of the stories told about Billy Graham involves an incident that occurred while he was in a diner with some staff members. When the waitress serving the group recognised Billy, she dropped her tray, scattering dishes all over the place. Graham immediately leaped up and helped her clean up the mess. How many of us would reach out to another person and help her through an embarrassing moment? Billy Graham’s act defined good manners: consideration for the feelings of others. Send a creative present—to their kids. Be honest. What can you possibly get for the Big Kahuna that is actually going to impress her? But if you get her ten-year old an autographed baseball from his favorite player, or get a well-known person to send a handwritten note to her daughter, you probably won’t have a whole lot of problems getting your phone calls returned. Mackay’s Maxim In networking, you’re only as good as what you give away. Ah, the cocktail party/ fundraiser / charity ball/trapped in an elevator with ten of the strangest people you’ve ever met in your life. Unless you’re assigned to the Secret Service detail guarding the president, you’re not going to get the guest list for every gathering you attend, so you’ll have plenty of opportunities to wing it. As in most of life’s little moments, there’s a right way and a wrong way to do it. Here’s the wrong way: “the thirty second bonding maneuver.” In those thirty seconds, the perpetrator expects you to be convinced that he or she is so very sincerely interested in everything about you. By the way, what did you say your name was? You can spot these types every time. They’re talking to you, but their eyes are trolling the room for their next victim. The approach is also called “being seen,” but this loser doesn’t realise how many people are on to it. Most people have never figured out that it’s better to spend time with fewer people at a one-hour cocktail party and have a meaningful dialogue than practice the wandering-eye routine and lose the respect of most of the people they meet. I learned the right way by observing two of the world’s most popular and enduring public figures, Billy Graham and the late Norman Vincent Peale. When Graham or Peale met someone for the first time, they made that person feel like the most important person in the room. They made eye contact and kept it. • They smiled. • They listened. When they talked, they asked questions or made comments that showed they were hearing and were interested in what the other person had to say. If the conversation was just polite banter, they had a topical joke or quip—usually a pretty good one. If it was more substantive, they gave the other person a chance to make a point without interrupting. When they had to break off a conversation, they did it graciously, by offering to exchange cards and asking the other person to call or write them. Is it any wonder that these two men created two of the most effective networks on earth? Mackay’s Maxim Networking is not a numbers game. The idea is not to see how many people you can meet; the idea is to compile a list of people you can count on. You’ll realise you’ve found the well of life—other people. IT IS BETTER TO GIVE BEFORE YOU RECEIVE. Network members who call you when they have something that might be an opportunity for you, rather than when they need something from you, are “A” listers by definition. By the same token, you’ll make a lot more “A” lists yourself by being proactive on the behalf of your network rather than reactive. If you could have a bird’s-eye view of a networking transaction, it would resemble two people working a crosscut saw. Round 1: One side pushes. The other side pulls. Round 2: The pusher pulls and the puller pushes. Put your memory where your mouth is. If you want to impress people with how much you care, show them how much you remember by doing favours for them before asking them to do favours for you. Mackay’s Maxim The old 80/20 rule still holds true. Twenty percent of your network probably provides 80 percent of the value. What have you done for them lately? I will not assume that the person with the credentials is the person with the power. I will not confuse visibility with credibility—mine or anyone else’s. I will never say no for the other guy. I will dance with the one that brung me, bad grammar and all. I will differentiate between my network and my company’s network. I won’t stall, I’ll answer the call. If I don’t know, or I’m not sure, I’ll ask my customers and my contacts. As a small-business owner, I’ll make “the personal touch” my mantra. I’ll catch the Zeitgeist and when it changes, I’ll catch it again. *Schnorrers always take a little bit more than they’re entitled to. Grumpfs are outright thieves and a nudge is someone who is merely annoying. BUILD A NETWORK THAT REACHES EVERY LEVEL. Want to build a network that breaks down communication barriers and unites every level of the organisation? Here’s the best way I know. Spend at least one week a year in the trenches—working on the line, pushing broom, toting barge, lifting bale—doing whatever are the toughest, most menial jobs the company has to offer. It is a real morale booster for your entire crew when they see you do your Armanis and actually do the nasty stuff they have to do to make a living for themselves and their families. Believe me, anytime a boss will roll up his or her sleeves and actually do some grunt work, word will reach every corner of the shop. Mackay’s Maxim It doesn’t matter how well you’re leading if no one’s following. Get more out of this Book Summary by applying what you’ve read to your life. Here are a few thoughts and questions to get you started. Actively seek new ways to meet people. List four groups outside your extended family with which you can begin networking. Plan to attend an industry networking event within the next three months. Get outside the work circle. How often do you network with those who share a common, nonprofessional interest with you? List three ways you can differentiate yourself. Take action on at least one of your ideas today. How many “A” listers are in your network? How many “A” lists are you on? Do a favor for at least one person today without them asking you to. You could make a referral, share a lead, send an article they might enjoy, etc. Start keeping relevant notes on the people you meet or speak to so you can follow up in a meaningful way. This is an important book which brings the concept of business networking to popular awareness. If you’re truly serious about building a successful business then networking is perhaps the most important skill you can master and Harvey MacKay is the master teacher. Grab a copy and have a read for yourself.